If you came directly to this page you may wish to read a page on the medieval monuments of the town or a page on its Cathedral first. In 1309 Pope Clement V decided to permanently settle at Avignon in southern France. For the following half a century the popes did not have much authority over their Italian possessions and Orvieto experienced a period of intense internal conflicts. Eventually in 1334 Ermanno Monaldeschi established his rule over the town and at Bolsena. In 1337, following the death of Ermanno, violent quarrels arose among the four branches of the Monaldeschi. These conflicts caused the decline of Orvieto and in 1348 its economy and population were badly hit by the Black Death, a major pestilence. 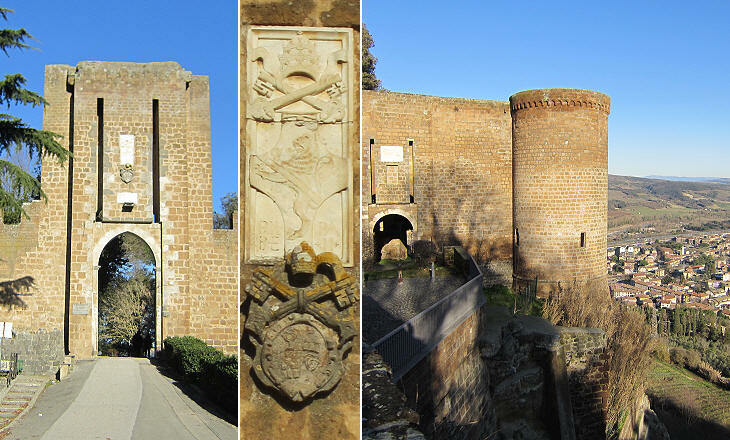 In 1354 Cardinal Gil de Albornoz restored papal authority in Orvieto and he built a small fortress at the eastern end of the town near Porta Postierla. In the following century the fortress was redesigned with the addition of circular towers. In December 1527 Pope Clement VII managed to escape from Castel Sant'Angelo and he reached Orvieto where he lived for six months in the Papal Palace. During his stay he realized that in case of siege Orvieto lacked a reliable water supply. In addition a medieval aqueduct had fallen into disrepair. The Pope commissioned Antonio da Sangallo the Younger the construction of a well to reach the water from a spring which emerged at the foot of the rock. Sangallo's workers had to dig 53 meters/174 feet to reach the water. 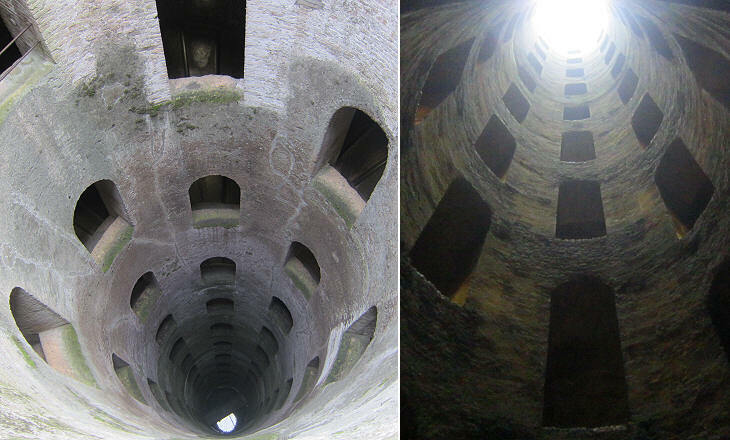 The well is wide 13 meters/14 yards and it is made up of two spiral staircases of 248 low steps. The staircases were wide enough to allow donkeys to descend on one, cross a bridge over the water where their buckets were filled and return to the surface by the other one. The well is named after St. Patrick because according to a legend the saint showed his followers a pit as the entrance to Purgatory. It was completed in 1537 and it was decorated with the heraldic symbol of Pope Paul III, who succeeded Pope Clement VII in 1534. Pope Paul III had four children by Silvia Ruffini, widow of Bartolomeo Crispo, a rich merchant. In 1544, most likely at the request of his daughter Costanza, the pope appointed her stepbrother Tiberio Crispo cardinal. Although Crispo was not a member of the Farnese family he decorated the portal of his palace at Orvieto with their heraldic symbol. The palace was built following a project developed by Antonio da Sangallo the Younger and it vaguely resembles the Roman palace the architect designed for the Farnese. 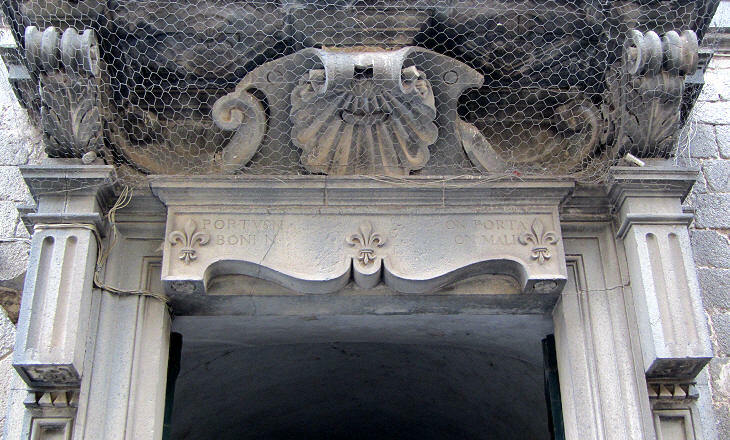 Portal of Palazzo Simoncelli Carvajal with the inscription "Portus non porta boni non mali" which must be read as "Portus boni non porta mali" meaning "Good haven not gate to hell"
This palace was built by Cardinal Girolamo Simoncelli, a relative of Pope Julius III, who was Bishop of Orvieto for many years. The palace was inherited by Carvajal Simoncelli, Bishop of Sovana, a small town in Tuscany near Orvieto, who enlarged it and had the portal decorated with a puzzling inscription. 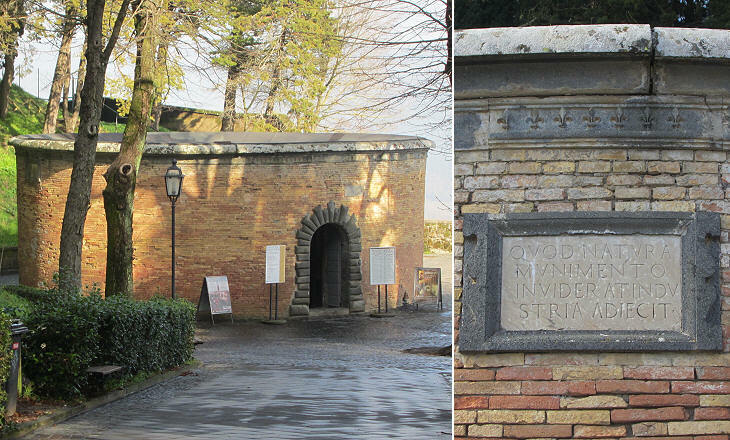 The design of the portal is attributed to Ippolito Scalza, an architect who spent all his life (1532-1617) at Orvieto. 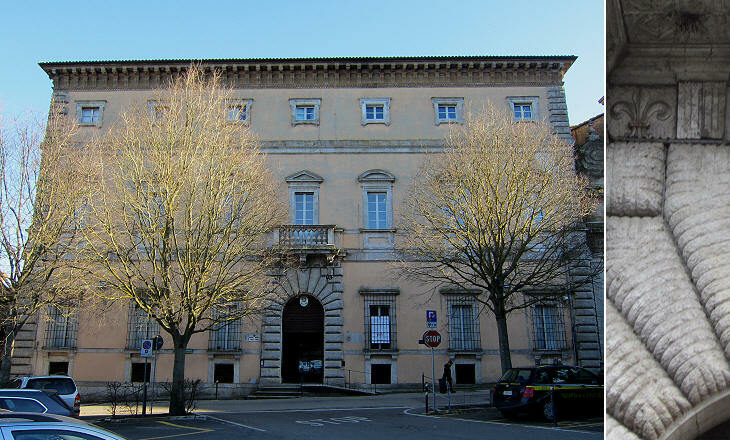 In 1573-81 Ippolito Scalza supervised the renovation of the medieval palace which housed the administration of the town. 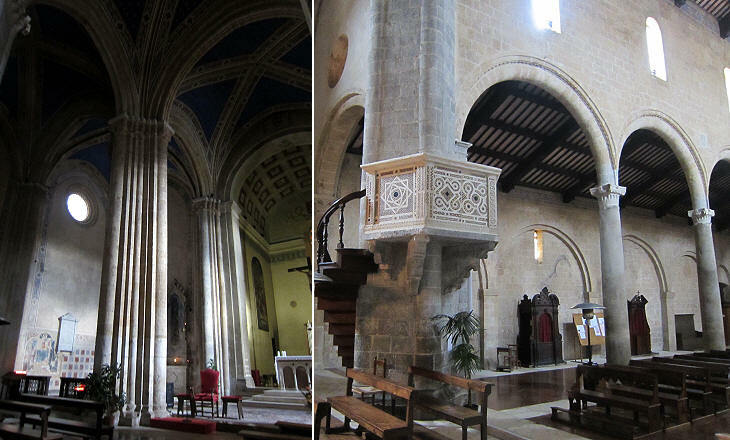 The building adjoins S. Andrea, one of the oldest churches of Orvieto. In 1928 the façade and the nearby tower were brought back to their assumed XIIIth century aspect with an overall unsatisfactory result, especially for the façade. The tower resembles that of Abbazia dei SS. Severo e Martirio in the outskirts of the town. 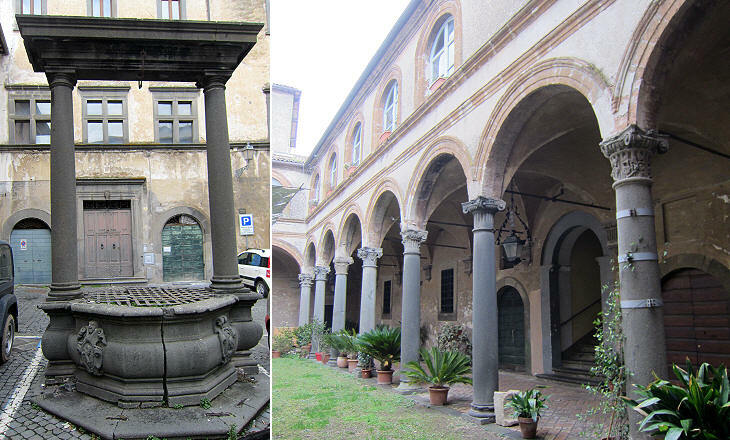 Unlike Rome and many other Italian towns Orvieto could not rely on ancient buildings from which to take columns, capitals and other decorative elements, yet for the renovation of S. Andrea which was completed in 1512 eight large ancient columns of grey granite were acquired. The capitals however were made locally. 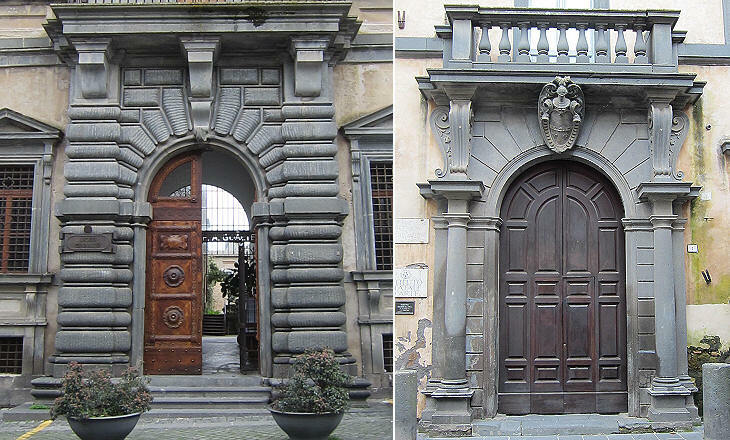 Ippolito Scalza designed the portals of several palaces at Orvieto. He always made use of bugnato, a typical Florentine decoration based on large stones projecting from the wall. Each portal however had its own distinctive features. Several XVIth century Roman palaces (e.g. 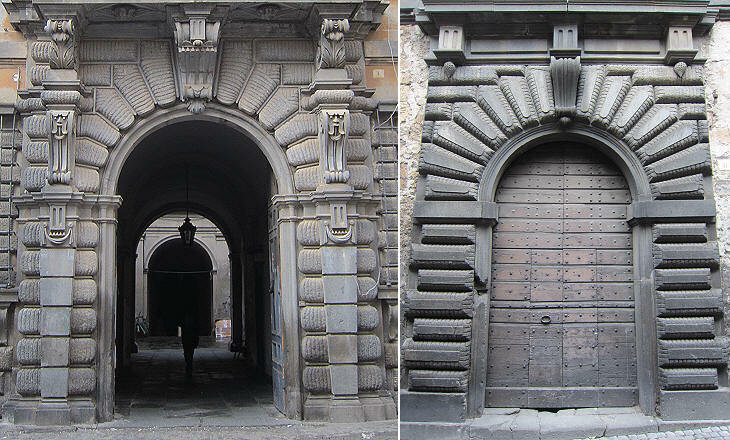 Palazzo Ruspoli) had portals similar to those designed by Scalza at Orvieto. 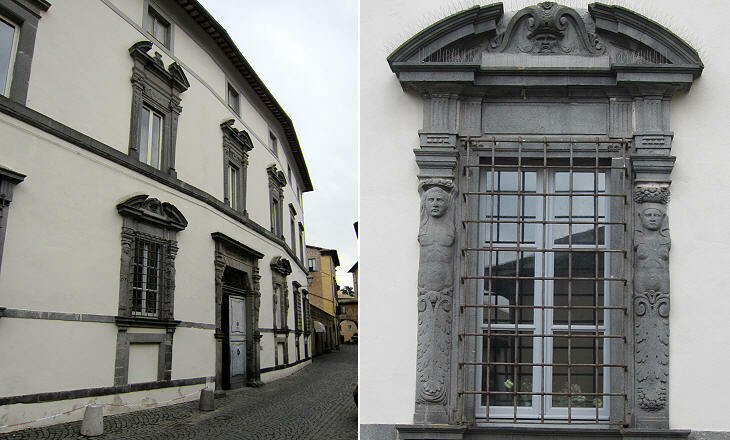 That of Palazzo Monaldeschi has a gentler appearance because of the two columns at the sides of the entrance. The Monaldeschi had a palace in Piazza di Spagna in Rome which they eventually sold to the King of Spain for his embassy. Towards the end of the XVIth century the popes redesigned the administrative division of the Papal State. 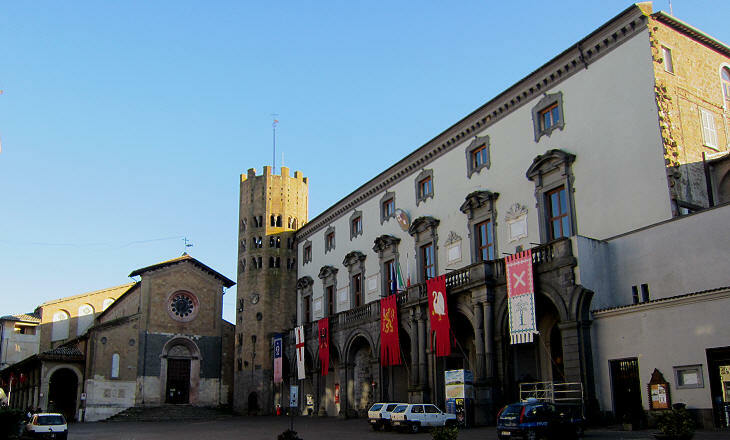 Orvieto retained jurisdiction over a very small territory and at one point it was even suggested to incorporate the town in Patrimonium Petri, the province of Viterbo. This explains why no major monuments were built in the town in the XVIIth and XVIIIth centuries.